Due to the changing landscape of legal services, small to medium sized law firms need to consistently update their financial management processes. Essentially, these firms need to provide affordable services to their clients while ensuring the owners get the compensation they believe they deserve. But without necessarily having an in-house financial manager, how do they maintain the right balance? In this episode of The Digital Edge, Sharon Nelson and Jim Calloway interview John Iezzi, author of “Results-Oriented Financial Management: A Step-by-Step Guide to Law Firm Profitability,” which is a book about compensation issues in small and mid-sized firms, what successful financial management looks like, and changes small firm lawyers need to make. Special thanks to our sponsors, ServeNow and CloudMask. Sharon D. Nelson: Welcome to the 91st edition of The Digital Edge, lawyers and technology. We’re glad to have you with us. I’m Sharon Nelson, president of Sensei Enterprises. Jim Calloway: And I’m Jim Calloway, director of the Oklahoma Bar Association’s Management Assistance program. Sharon D. Nelson: Before we get started, we’d like to thank our sponsors. CloudMask offers cost-effective and efficient data encryption for law firms. Whether large or small, in Google Apps, Office 365 and other Cloud solutions. Sign up now for your 60 day free account at CloudMask.com. We also thank Serve-Now, a nationwide network of trusted, prescreened process servers. Work with the most professional process servers who have experience with high volume serves, embrace technology, and understand the litigation process. Visit ServeNow.com to learn more. Jim Calloway: Today our topic is Results-Oriented Financial Management for Lawyers. We are happy to welcome John Iezzi as our guest. John has a wide berth of experience in all the areas of financial and administrative management with specific emphasis in the professional service environment. He spent 16 years as the administrator of McGuire, Woods, Battle & Boothe, a 300 lawyer firm headquartered in Richmond, Virginia. In addition, he served as senior manager in the law firm consulting group at Price Waterhouse and director of consulting services with Information Technologies Corporation. Mr. Iezzi is considered a national expert on law office management, particularly in the financial management area and is the author of the third edition of Results-Oriented Financial Management. Thanks for joining us today, John! John Iezzi: Thanks for having me, Jim and Sharon, it’s a pleasure to be with you today. Sharon D. Nelson: Let’s start by asking you, how did you first get the idea to write Results-Oriented Financial Management for lawyers? John Iezzi: Actually, by 1995 I had had about 23 years in the law office management business and I had given several speeches and I had written several articles and I just thought it was a good idea to put in writing what I had learned and developed over those years as both a manager of a law firm and as a consultant. I really never thought that they would last this long and that in 2015, I would be publishing the third edition. So interestingly enough, when you do a book in accounting, unlike a legal book, the various issues change so it wasn’t that difficult to keep the book current and update it on a relatively current basis. Jim Calloway: Well that’s peaked my curiosity a little bit. How has the book changed over the last three editions? Are there technology changes that impact the book? John Iezzi: There’s no question that technology influences what was in the book. When I first published it in 1995, I had devoted an entire chapter on what I referred to as strategic technology planning. Even though on a scale of one to ten, my actual technology knowledge is about a three or a four. I did know enough, however, to provide some guidance to firms on meeting with the soon to be exploding technology innovation. My emphasis was not on the bits and the bytes, but more in the area of strategic information automation technology planning, as related to those issues that would impact the firm’s bottom line. In the 2000 edition, that chapter was completely eliminated, it was no longer relevant. There have been a lot of advances in time in billing technology, which has influences how firms record bill and collect the work that they perform for their clients. All of my clients use Tabs software and over the years I developed several reports that I share with others in a separate chapter of my book. There are a lot of other good systems out there as well. Sharon Nelson: Well, John, I’m a fan of Tabs too, so I’m with you. Tell us why this book is different from others, and obviously there are a number of books about financial management. What makes yours so different? John Iezzi: Well I think what distinguishes my book from the others – and there are a lot of them out there and there are a lot of good ones – is I consider mine to be a how to book. If you want to develop a compensation system for your firm, you go to a specific chapter of the book and find out how to do it. If you want to set profitable billing rates or reintroduce an annual budget, there are chapters in the book that deal with those areas and explains exactly how to do it. I believe that is been the major reason for the success of the book and why after twenty years it could change the sale. And I think that’s why the ABA asked me to create the third edition in 2015. Jim Calloway: Is this a book just for lawyers, or can anyone in business benefit from reading it? John Iezzi: Jim, actually I believe the ABA has failed to recognize that the majority of purchases of this book are not attorneys but rather non attorney law firm managers. I’ve gotten some comments from attorneys but quite frankly, most of the questions and comments on my book have come from non attorneys. That’s why I’ve devoted some chapters of my book specifically to that group. In fact, when the 2015 edition came out, the ABA questioned me as to why some of the chapters were in there, believing that attorneys would have no interest in them. However, I convinced them that most of the sales of the book will be by non attorneys. It’s a general rule, most attorneys have no interest in this subject. Recently I had the occasion to speak at the National Convention of the Association of Legal Administrators in Nashville and to a group of administrators in Orlando. In both instances, there was great interest in my book. Sharon Nelson: John, I think there are a lot of major issues today, but in small or midsized firms, what would you identify as the primary issues? John Iezzi: Sharon, that is a good question and I think the answer needs to be put in perspective with what I would consider to be the types of practices in which today’s law firms are engaged. There are really two types in my opinion. There are firms that I would refer to as a client based practice and those that I would refer to as a case base practice. Most law firms have a client based practice. They have a group of big clients for which they perform lots of different services and for whom they know each year, they’re going to receive a certain level of revenue. These clients are institutional in a sense that they identify with the law firm and not with any particular attorney within the firm. That was the case of my old firm at McGuire Woods. So if an attorney should leave or be terminated or retire for any reason, more than likely the client stays with the law firm. These are primarily business clients who then produce other work, whether it’s litigation, employment law, tax law, et cetera. Smaller and midsized firms have what I refer to as a case base practice. A case comes in the door, they perform the work. Hopefully they get their fees, and then they wait for the firm to ring to get the next case. In most instances, this work comes from the efforts of specific individuals within the firm. Either their expertise, their reputation, their access to the company owners, et cetera. As you know, in law firms today, there are finders, minders and grinders. Those who produce the work are the finders, and the challenge for the small to midsized firms is to make certain that these finders are properly compensated for their efforts while at the same time, making certain that another group of finders are coming up through the ranks to keep the current form open and profitable once the current group of finders are no longer there. So the compensation issue in the small and midsized firm becomes a single most important issue that I deal with mostly with my clients, along with helping them to create the next generation of owners who can originate the business necessary to keep the firm open and profitable. Sharon Nelson: Jim, I know you have another question, but can you tell us, John, because I honestly don’t know. I’ve never heard the term finders minders and grinders. I get the finders. What are the minders and grinders? John Iezzi: The minders are the people who are responsible for making sure that the work gets done on time, the clients get billed, they follow up on collections, they deal with the client on a day to day basis as issues come up. The grinders are the people who sit in the back room and do all the work. They do the briefs, they do the research, they write the memos, and they give the information to the partners who then present it to the client. So you’ve got the finders that get the work, the minders who manage it, and the grinders who actually do it. Jim Calloway: Well, the law firms have been around a long time operating successful businesses after all these years. Why do we still have those types of issues? John Iezzi: Well, Jim, in my mind, compensation will be an issue forever and will never go away. It’s interesting that when I talk to firms, when times are good and most lawyers feel like they’re being fairly compensated for their services, it is not that much of an issue. It becomes a real issue, however, when times are not so good and attorneys believe that for whatever reason, they are not being fairly treated. That is when people start getting upset, they leave the firm, and in many cases takes clients with them and do identify with specific attorneys rather than the firm itself. You need to recognize – and I think most lawyers fail to recognize – that owner compensation has nothing to do with actual dollars. It is strictly a relationship issue. I don’t care how much you make, so long as I make twice as much as you do. If you make a hundred thousand, then I want to make two hundred thousand, et cetera. So when I go into a firm and talk to them about compensation, I don’t necessarily look at how much individuals make necessarily. I look at how much they make in relation to other people in the firm. So it’s a question of relationships and not in actual dollar amounts. Sharon Nelson: Let’s pause here for a commercial break and then we will be right back. Advertiser: In recent years, the legal sector has come under increasing pressure to improve efficiency and client services. CloudMask enables law firms and solo attorneys to leverage free and low-cost Software as a Service, such as Gmail and Google drive, to improve efficiency and client service, while reducing cost,strengthening compliance with data privacy laws, and ensuring that legal ethical duties are met. CloudMask encryption is even certified by 26 governments around the world. Sign up now for your 60 day free account at CloudMask.com. Looking for a process server you can trust? Serve-Now.com is a nationwide network of local, prescreened process servers. Serve-Now works with the most professional process servers in the industry, connecting your firm with process servers who embrace technology, have experience with high volume serves and understand the litigation process and rules of properly effectuating service. Find a prescreened process server today. Visit www.Serve-Now.com. Sharon D. Nelson: Welcome back to The Digital Edge on The Legal Talk Network. Today, our subject is Results-Oriented Financial Management for Lawyers, and our guest is John Iezzi, the author of Results-Oriented Financial Management, published by the American Bar Association. John, it’s been my observation that lawyers care about how much they take home. But these law firm owners, do they really display an interest in the details of financial management? John Iezzi: Sharon, as I alluded to earlier, I do not believe that most law firm owners care much about the details so long as they’re getting their check each month in an amount that they believe is fair in relation to everybody else. They really could care less about the details. You always find in the law firm one or two partners who have a real interest in law firm management. But generally, they leave that up to the firm administrator. The problem is that there has to be someone in the firm at the owner level who needs to be involved and needs to understand the financial management aspects of managing a firm. Unfortunately, in the smaller firms – and I deal with firms in the 25 range all the time – this person doesn’t exist. And so that’s why managing several firms at the same time, which I do as a matter of course, has proven to be successful. I’ve been able to assume this CFO position in a small or midsized firm at a reasonable cost so they don’t have to worry about the finances. All they need to know – and I help them with it – is how to read and interpret the reports I provide and then to make the final decisions that are necessary to make sure that the firm stays on track. Jim Calloway: Once you give advice to a law firm, John, do they really follow it? And if they don’t, do they understand what’s going on? John Iezzi: This is actually question two, Jim, and the answer lies in whether there’s someone in-house that can implement the recommendations that I make. I talk to potential clients all the time and I tell them that if they don’t have someone in-house that’s going to follow up on my recommendations, or more importantly if the firm does not have the will or the agreement from everyone to make changes, then they’re better off not hiring me because it’s going to be a waste of their money and my time. On several occasions, I’ve actually lost potential clients because they were unwilling to make that commitment. Since I deal mainly with small to midsized firms, oftentimes there’s no one there to handle the implementation of changes, which in many firms are fairly significant. So what I do is I offer implementation services and then after that’s finished, I may go about hiring someone in the firm to carry on once I have left. Sharon Nelson: Well one thing you share with Jim and myself is that we’ve all been around for a while. So, John, how are law firm financial problems different today from when you started the business in 1972? John Iezzi: I think the issues are basically the same, they’re probably handled in different ways.The question is how can a small to midsized firm can serve whatever clients it has at a price the clients can afford and at the same time make sure that the owners of the firm get the kind of compensation that they believe they deserve. Obviously, from a mechanical perspective, technology has allowed firms to better understand the issues and they’ve had the ability to receive a lot more information that permits them to solve problems before they become unsolvable. The problem, again, is having somebody there that can interpret the information and know what changes need to be implemented. Depending on the area of the country, chances are there are too many attorneys for the amount of work to be performed. So therefore, all the law firms are out trying to get the same business. In addition, you have the problems of accelerating business rates as well as work being performed by non attorneys which makes it difficult because it’s easy to get new business. Especially because the firm is a case based firm as opposed to a client base firm. You hear attorneys saying all the time, and I’ve been hearing this for 40 years that they have to operate more like a business. My attitude is what they need to do is not operate like a business but rather operate more businesslike. Many firms still manage their firms with what I refer to as a checkbook mentality. So long as there’s enough money in the bank to pay the bills and pay the owners, then everything is fine. The problem is when the funds get depleted, the firm has no idea why or what to do to correct the problem. They then take the easy way out which is to borrow money. And in many cases, these borrowed funds are used to pay themselves. For many firms this could be the beginning of the end. I want to make one point as it relates to technology. The 20 years that I’ve been preaching to firms to stop billing by the hour and start using some other method. Unfortunately, the profession – and we are probably the only profession compared to the engineers and the accountants – as a whole that have not been very successful in doing that. Thus, all this money that’s spent on technology to produce a better product and less time has benefited the clients, which may be good, but not necessarily affected the firm’s bought in the line number. This is not easy and I devote a whole chapter in my book on this subject. In my own practice, I never bill by the hour. If I did, my billing rate would be so high that no one would ever hire me. Because of my experience and my work product, I could never make any money charging a billing rate that my clients would accept. So generally, I give my clients a fixed fee and tell them what I’m going to do, how I’m going to do it, what they’re going to get when I’m done and how long it’s going to take to do it. Generally, they’re able to say, “How many hours is that going to be?” And generally I tell them it doesn’t make a difference. As long as you’re happy with what I’m going to charge you, how long it’s going to take is irrelevant. If you combine all this with the idea that attorneys – especially at the associate level – are not working as hard as they did in 1972, you can see the financial dilemma is very real for many firms. Jim Calloway: John, you’re hired by law firms and when they hire you, what’s the number one issue that law firms want guidance on and what’s your number one tip for them? John Iezzi: Once we get through just solving some of the internal issues, we get back to this issue of part of billing. And then I tell my clients to do what I do, and I tell them I don’t get paid for what I do, I get paid for what I know. Experienced attorneys need to understand that and to gage their billing habits on that concept. If they continue to bill by the almighty billing rate, then they’re never going to realize the kind of bits of their experience, their expertise, and they’re never going to be able to take advantage of all these major technological advances that has significantly changed the practice of law and how clients are served. One significant example is in the area of legal research. I was part of a group of firm managers that went to Minnesota in 1978 to meet with representatives of West Publishing when they were making the decision to convert their research materials into a digital form which eventually became WestLaw. There’s also Lexus and there’s others as well. So researching the two hours now might take fifteen minutes. Unfortunately, the attorneys charge fifteen minutes, thus the client gets the benefit which again might be good, and the attorney loses almost two hours of billable time. This is one example of the problem of – in my opinion – of not taking technology into account when determining fees that are charged for client services. Sharon Nelson: I think one of the things we need to ask you is how do people buy your book, John? John Iezzi: They can go online to ABA and buy it. Within about two or three months, it will also be on Amazon and they can go on there and buy it as well. Sharon Nelson: Yes, so just go to the ABA webstore, that’s the easiest thing to search on to buy. John Iezzi: So far, the easiest way is probably the least expensive way to get it. Sharon D. Nelson: And I really enjoyed reading your book, John. I want to thank you for sharing some of your expertise with us today. I particularly hear the point about hourly billing being really not the way to go. Alternative billing and really recognizing the value you provide for your clients, that’s a very important thing. Thank you so much for being with us as our guest. John Iezzi: Well thanks for having me, Jim and Sharon. 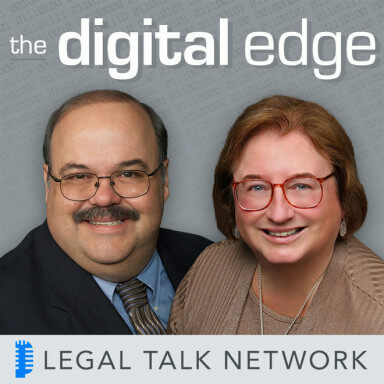 Sharon D. Nelson: And that does it for this edition of The Digital Edge, lawyers and technology; and remember, you can subscribe to all the editions of this podcast at LegalTalkNetwork.com, or on iTunes. And if you enjoyed our podcast, please rate us on iTunes.